Do you ever go to a party that warrants dressing up, but not too much? By that I mean festive and bright and not informal — but short of shine, sparkle and/or décolletage? Like a work party? I go to an office holiday party every year. Some years (the even numbered years), the office party is an evening party and involves shine, sparkle and even décolletage. But this year (an odd-numbered year), the party is a fancy lunch and a day dress is the thing to wear. I have a charming, knee-length, red wool dress with origami-like flowers all over the bodice that I have worn on more than one occasion. But I can’t wear that dress every year, so this year I thought this dress would do the trick. Most of my winter dresses are dark (mostly navy, grey, and black), so I bought this dress to add a little variety. 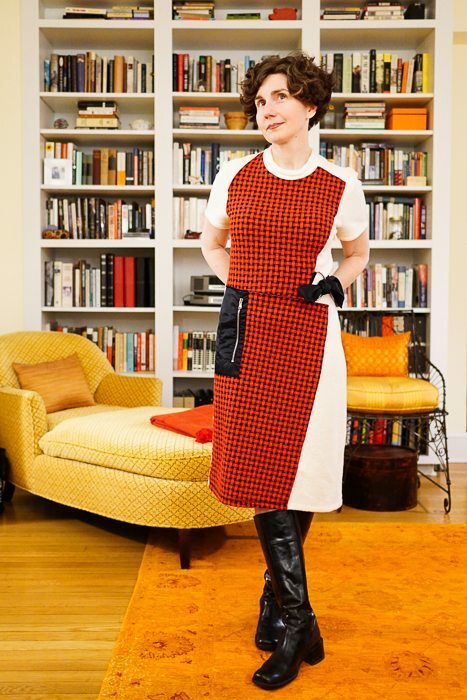 It’s visually lighter — ivory is so pleasing in the winter — and I love the the quirky style. The foundation of the dress is a very fine, soft ivory boucle; houndstooth fabric is appliqued on to the boucle. And then techno-fabric accents (in a crisp nylon) are appliqued on top of that. The back side of the dress is quiet, but not without interest. 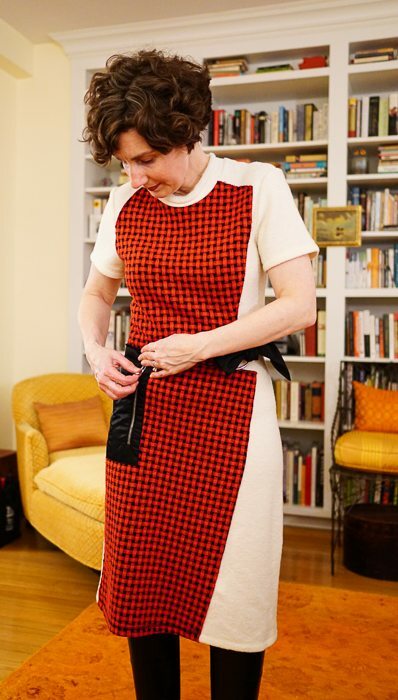 It is pieced to create a set waist and an asymmetrical hem. 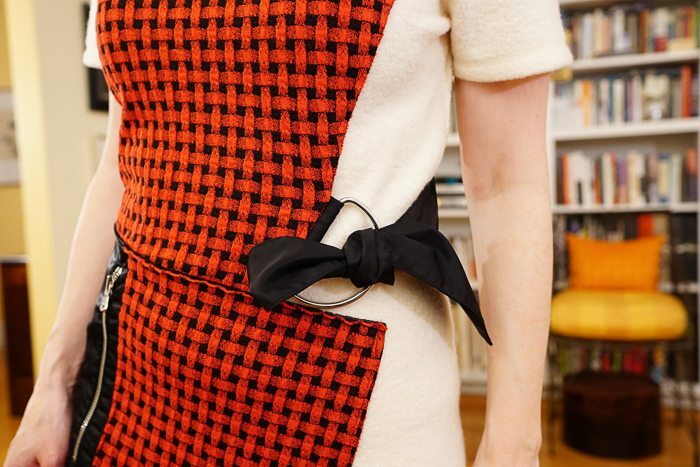 As shown by the designer, the sash just loops through the D-ring and hangs. Worn like that, it looks (to me) like a black tongue, so I’ve knotted it. As a pocket enthusiast, you can imagine my delight at this graphic detail. However, a little testing revealed a major design flaw. This pocket is perfectly placed . . .
A Confidence: I had originally envisioned this post as a dramatic “before-and-after” tutorial. The sleeves need to be adjusted a little at the shoulder — i.e., the shoulder seams need to be shortened an inch or two. But after seeing the “before” photos, I realized that the difference post-alteration may only be noticeable to me. I’ll let you know! Thanks, Jodie — I will try the dress with my other boots (which have a round, but not pointy, toe) and low heels and add an addendum in the future! What a fun dress. I much prefer the way you tied the stash. I like the bits of metal – the “D” ring and exposed zipper are rad. 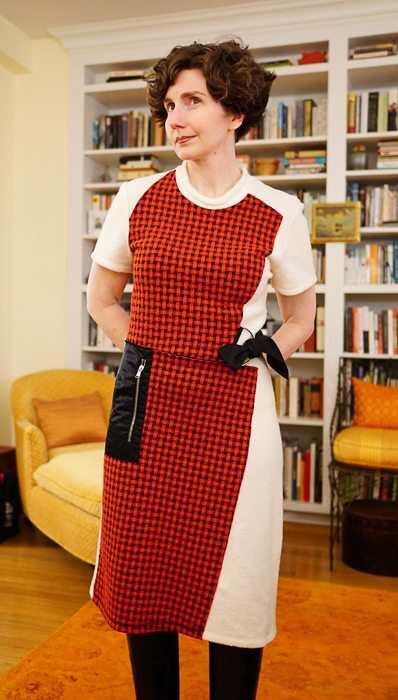 Not sure if you watch CBS’s “The Good Wife” — but one of the main characters wore this dress recently! It was either episode 6 or 7, current season (7). Ha! Thank you for telling me. 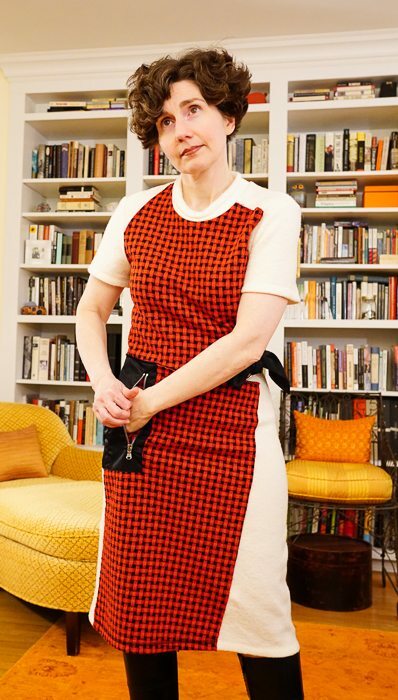 I found a website that seems to be devoted to the costuming of The Good Wife and found a still photo. She looks good!